Heat sauce pan over medium heat and add bacon and butter. Once melted and bacon has begun to render, add celeriac, onion, leeks and carrots. Saute until vegetables become translucent and add flour and mix until incorporated. Cook for about five minutes on low hear and then deglaze with white wine. Once alcohol is cooked off (about 1 minute) add prawn stock and turn heat back up to medium. Add heavy cream and diced tomatoes and potatoes. Cook for an additional 30 minutes on a gentle simmer and then add riesling vinegar, parsley and thyme. Stir in the raw prawns and cook for an additional 2 minutes. Season with salt and white pepper. Place all ingredients in pot and bring to boil. Cook for at least 30 minutes. Strain and dry in 180°F oven for 6 hours or until completely dry. Place in 350°F frying oil until they puff nicely. Remove and season with salt. At this point we lightly smoke with applewood chips for 10-15 minutes. 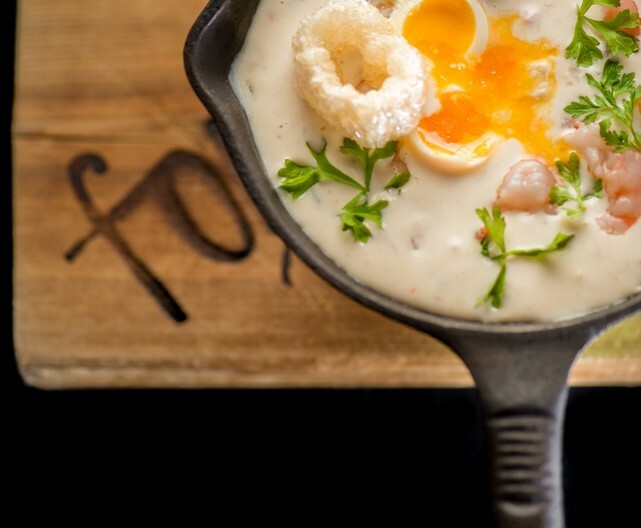 (optional) Place chowder in bowl of your choice and garnish with soft poached egg and chicharon.